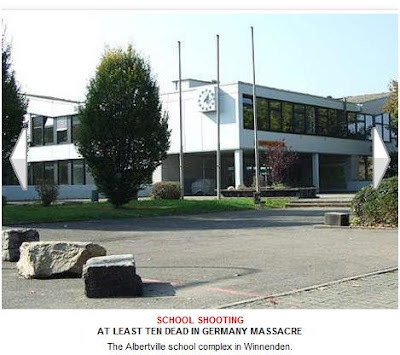 Winnenden, Germany—A 17 year-old former pupil of the Albertville School returned wearing black combat gear, was armed with a weapon, opened fire and has murdered 12 students and three teachers. Responding police killed the young gunman after two cops were wounded by gufire. The school is not far from Stuttgart and in an area where violent crime is rare. Germany has some really restrictive gun laws that preclude most citizens from using firearms for self-defense. As always the gun laws do nothing but facilitate cowardly criminals who are assured by misguided laws that nobody can resist being victimized. It is essential that there are trained and well armed people protecting vulnerable children. Guns are always used to protect money, why don’t the even more valuable children deserve the same meaningful protection? Of course like politicians everywhere you can expect many in Germany to demand even more gun laws that will facilitate even more violent acts by criminals protected by bad laws.